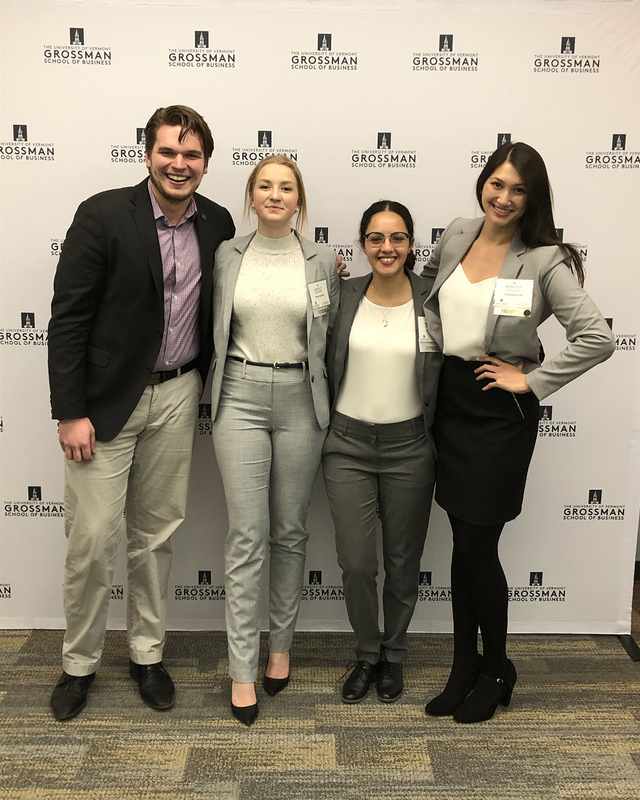 Bachelor of Commerce (BCom) students, Cassandra Lee, Nicole Opsteen and Hala Saoudi, finished first in the undergraduate competition, among 13 competing teams representing business schools from four continents. In addition, Hala Saoudi won the Best Presenter award for the final round of competition. “We went to FECC with the expectation of doing very well, as we had put in many long hours preparing for the competition,” said Cassandra. From left to right: Coach Liam Gravely, with Sprott team members Nicole Opsteen, Hala Saoudi, and Cassandra Lee, at the University of Vermont’s Global Family Enterprise Case Competition. During the competition, students applied the knowledge and expertise they developed in the classroom towards solving complex family business cases. Teams presented their case during four rounds of competition to a distinguished panel of judges who determined which group best understood, analyzed, and presented the case. “Simply put, the overall experience was incredible,” said Liam Gravely, BCom 2017 graduate and coach of this year’s team. “We were very fortunate to have three experienced competitors on our team who were able to learn new content quickly, as well as adapt to the judges’ feedback after each day of the competition. Through Sprott Competes, the school’s case training and competition program, the Sprott team practiced each week throughout the months of October and November. The students completed four-hour case presentations, as well as a two-week take home case to help fine tune content comprehension and prepare for the first part of the competition. Established in 2013 at the University of Vermont’s Grossman School of Business, the sixth annual Global Family Enterprise Case Competition was its largest event yet. Twenty-five business schools from countries all over the world participated in the undergraduate and graduate streams of the competition.